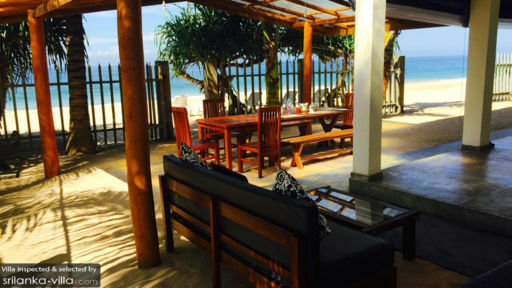 Experience the best of beachfront living at Sunset Reef Beachfront Villa. Wake up to sweeping vistas of the golden shores and turquoise waters of Ambalangoda, a coastal town set in the south of Sri Lanka. Enjoy being located just a skip away from the beach, where lazy sunbathing sessions and leisurely beach strolls are part of the experience. Containing a total of seven bedrooms, Sunset Reef Beachfront Villa is made up of two standalone villas - three bedroom Peacock Gardens and four bedroom Sunset Reef - to house up to 15 guests. 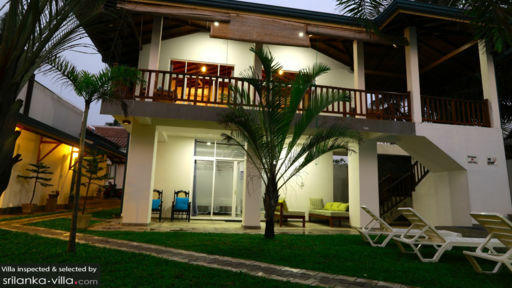 With seven bedrooms, Sunset Reef Beachfront Villa is ideal for accommodating large groups of up to 15. The bedrooms are spread out across two standalone villas: three bedroom Peacock Gardens and four bedroom Sunset Reef. Guests at Sunset Reef will enjoy ocean views and private verandahs from each of the four bedrooms within the villa, along with a full range of modern amenities like private en suites, air conditioners, ceiling fans, tea making facilities, cable TV and sofa sets. All three bedrooms at Peacock Gardens are also outfitted with similar amenities. Make a splash at one of the two swimming pools located within the compound. The expansive pool and garden at Peacock Gardens are ideal for large group gatherings, while Sunset Reef offers a neatly manicured lawn, verandah and smaller-sized pool for hosting intimate soirées. Guests have access to two common living spaces, each of which is housed in a standalone villa. Both are spacious and airy, and bright with natural light, offering a cosy setting for movie marathon, afternoon siestas and private relaxation. Enjoy impeccable service from a housekeeping team of 14, including a personal chef with much experience in cooking up a feast of international and Sri Lankan dishes. Guests may undertake culinary lessons with the in-house chef. 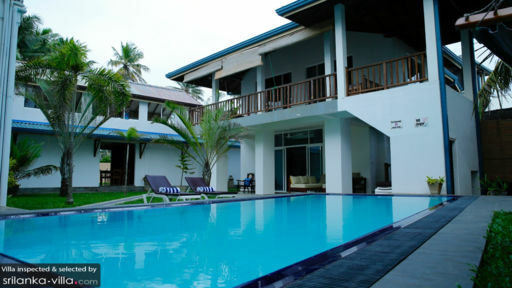 Sunset Reef Beachfront Villa enjoys impeccable service from a team of 14. Personal guest services and 24/7 security service are available free of charge. Services available at additional cost include: airport transfers, vehicle rental, personal driving services, child minding services, laundry, in-villa massages and personal chef services (for lunch and dinner).